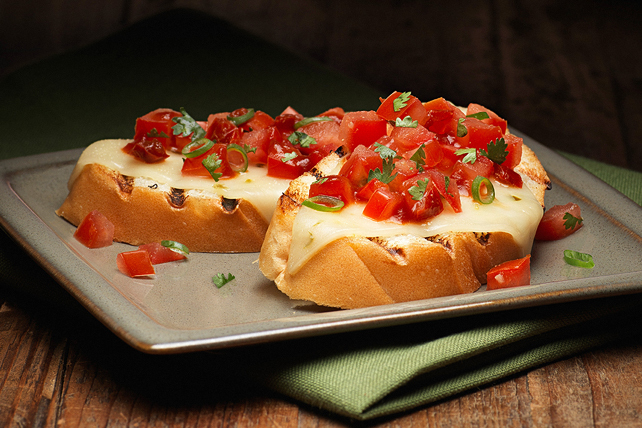 Here's an easy way to make grilled cheese for a crowd—deliciously! The not-so-secret ingredient here? From-scratch salsa with fresh cilantro. Cover half the grill grate with sheet of heavy-duty foil. Grill bread slices on uncovered side 30 sec. to 1 min. or until bottoms are golden brown. Turn bread slices over and place on foil-covered grate. Top with cheese, then tomato mixture. Grill 3 to 4 min. or until cheese is melted and tomato mixture is heated through. Cut tomatoes crosswise in half, then gently squeeze out seeds over sink.